Another Beautiful Day in Paradise. We had beautiful clear blue skies, with a little breeze and temperatures starting in the high 60s and ending in the low 70s. Bladers/Bicyclers Rob H, Jim F, Dan C, Steve G, Janice H, Linda C, Carol J, new bicycler Claudia R & and Andrew F, Bruce M, Mats B, Dee T, Jeff B and Wilma F. Welcome all. We did basically our regular Pink Streets route. Jeff did lead us on a couple of different ways. We happened onto Linda S out walking the Pink Streets. Was good to see Linda and also Janice that we hadn't seen in a while. Everyone did the 10 mile route. There were 11 Bicyclers and 3 Bladers. We selected Munch's to Brunch at. We got right in and seated at one table. Service was good and the coffee flowed freely. The food was good as usual and we had ratings from 9.7 to 10. We'll give Munch's a 9.85. 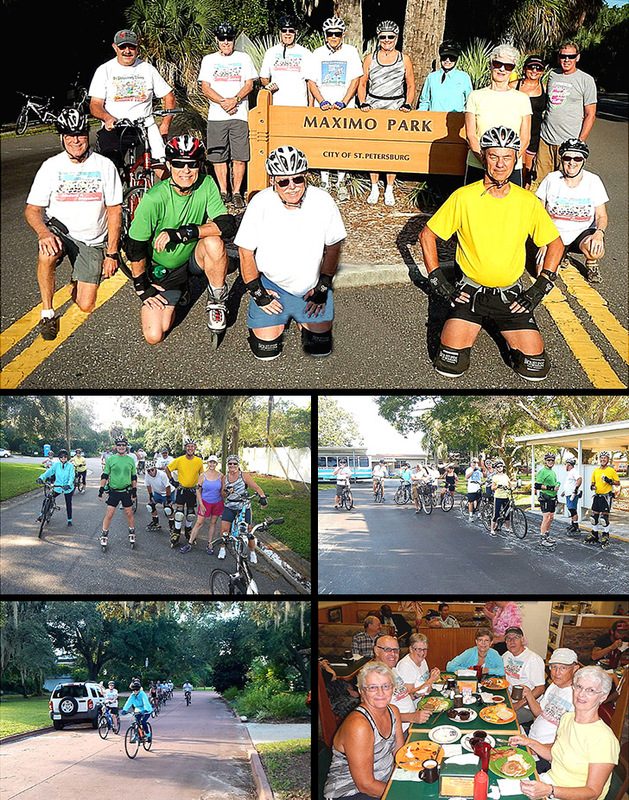 Don't forget to sign up for the Pinellas Trail Skate on Saturday the 15th. There is blading/bicycling on the 13th, 14th and the 16th. Also there are social events on the 14th, 15th and 16th. Check out the details/registration page! Unfortunately all the bus bicycle spots have now been taken.